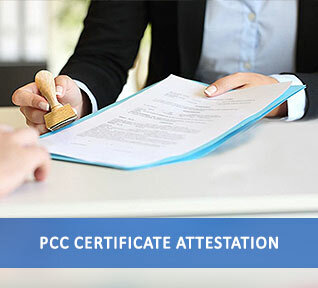 PCC certificate attestation is the act of witnessing a PCC certificate by authorised person/persons/Departments/authorities with their official seal and signature. Such a PCC attestation proves that the particular PCC certificate has been issued by that mentioned department and seal and signature on that particular PCC certificate is genuine. Attestation of PCC Certificates from India: Attestation of PCC Certificates has to be completed first from the home Country of the applicant from where the Certificates was issued, then the Foreign Country, where the candidate planning to migrate /travel. HRD attestation from India is not required on PCC certificates. We can do GAD/Home Ministry/Home Department, Mantralaya, Secretariat Attestation and Notary Attestation, MEA (Ministry of External Affairs) attestation, Embassy or Consulate Attestation and MOFA attestation for all PCC Certificates from the State Government Departments and foreign embassies. A Police Clearance Certificate is an official document issued by the Police Department or Regional Passport Office to confirm whether the applicant has any criminal record including arrest conviction and criminal proceeding etc. Police clearance certificate helps to ensure that the person is not harmful to individuals and the country. It is issued by police authorities and Regional Passport Office and Passport Seva Kendra and used to prevent individuals who pose a risk to a country’s security from entering foreign countries. Attestation of PCC Certificates from India is required for getting visa from Gulf Countries like UAE, Qatar, Oman, Kuwait, Saudi, Bahrain etc. The Attestation on a PCC Certificate shows the evidence or proof of its originality and the departments who attested the same confirms it in an official capacity. All the countries in abroad ask this type of confirmation to avoid complications in future. Documents required for PCC certificate attestation are Original PCC Certificate, Passport Copies, Photos, translation of PCC certificate etc. Ministry of External Affairs of Delhi (MEA) is providing Apostille Attestation on PCC certificates for travelling to Hague member countries. Apostille stickers will be issued on the PCC Certificates. For apostille Attestation from MEA, PCC certificate should be attested by the designated authorities in the State from where the certificate/document has been issued. Home Department/General Administration Departments are the designated authorities for PCC certificates attestation. After getting attestation from GAD or concerned Home Department, the documents can be submitted for MEA/ Apostille attestation. After completing these attestations, you can further submit the certificate in the concerned embassy and later to the MOFA. Urogulf can assist you with the PCC attestation and for all related information. We can provide GAD/Home Ministry/Home Department, Mantralaya, Secretariat Attestation, Notary Attestation, MEA (Ministry of External Affairs) attestation, Embassy or Consulate Attestation and MOFA attestation for our customers of all over the World. Our dedicated team will handle the attestation process for you in a secure and professional way. You can submit the documents in any of our offices in India and abroad for attestation process. We will safely handle your documents and complete the process in a timely manner without any hassle. PCC Certificate Attestation Places in India and Abroad are Hyderabad, Guwahati, Patna, Chandigarh, Raipur, Dadra and Nagar Haveli, Panaji, New Delhi (NCT), Gandhi Nagar, Bhiwani, Panchkula, Simla, Jammu, Srinagar, Ranchi, Jharkhand, Bangalore, Gulbarga, Belgaum, Mysore, Sasthamangalam, Trivandrum, Kochi, Kozhikode, Green city-Bhopal, Mumbai, Shillong, Bhubaneswar, Pudducherry, Chandigarh-Punjab, Vaishali Nagar - Jaipur, Chennai, Luknow, Dehradune, Kolkata, Dubai, Sharjah, Abu Dhabi, Doha, Qatar, Muscat, Oman, Kuwait, Saudi, Bahrain, UK, USA, Australia, Panama, Canada, Russia, Sri Lanka, Nepal, Pakistan, Bangladesh, Philippines and all Countries if people of that Country want to work abroad. Urogulf provides Certificate Attestation Services through our own offices from the cities of Adoor, Ahmedabad, Alappuzha, Aluva, Anchal, Angamally, Attingal, Ayoor, Bangalore, Bhopal, Calicut, Delhi, Eranjipalam - Calicut, Changanassery, Chalakudy, Charummood, Chavakkadu, Chengannur, Chennai, Chingavanam, Coimbatore, Edathua, Irinjalakuda, Harippadu, Hyderabad, Jaipur, Kalamassery, Kalpetta, Kannur, Karukachal, Kayamkulam, Karunagappally, Kasargod Kottarakkara, Kottayam (1), Kottayam (collectorate), Kollam, Kottakkal, Kozhanchery, , Kothamangalam, Konni, Kumbanadu, Kuwait, Luknow, Madurai, Malappuram, Mallappally, Manglore, Manjery, Mavelikkara, Mumbai, Muvattupuzha, Mananthavady, Nagercoil, Nilambur, Oman, Orissa, Palakkad, Panthalam, Pala, Pathanamthitta, Pattanamthitta-2 (Collectorate Jn. ), Pathanapuram, Perumbavoor, Perinthalmanna, Punjab, Qatar, Ranni, Sikkim, Sulthanbathery, Trivandrum, UAE, Thodupuzha, Thrissur, Tirur, Thalayolaparambu, Thalassery, Thamarassery, Thiruvankulam, Vadanappally, Valanchery, Vadakara, Vadasserikara, Wadakanchery. Loyal Service . Keep the standard and safety policies . Thank you for your help.